Flea and tick treatment is a bit of hard work but with patience and a little dedication you should have a tick and flea-free home with no problems. First, let's understand a little about ticks and fleas. Click on these links to read about the dog flea and the cat flea. Domestic dog is the most common host; rarely cats or humans. Can produce 5000 eggs at a time Commonly found year round in warmer climate areas. 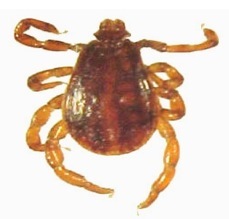 Most common tick found in the United States. Dogs are preferred as hosts, but will readily feed on other animals. 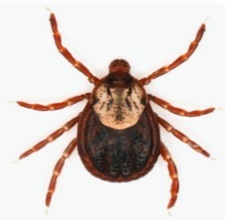 Carries Rocky Mountain spotted fever and is commonly involved with tick paralysis. Consult a veterinarian on the best way to keep pets from ticks and fleas; each individual pet requires different treatments. Pay special attention if used on a pet that is sick, pregnant, medicated, weak, aged, nursing pets, or pets with previous signs of sensitivity to pesticide products. Label prohibitions are just as important and warn against use on pets with conditions described above and others. Be extra careful when using spot-on products and read label until thorough understanding is attained. Use flea and tick treatment and control products only on animals specified by the product and its label - don't use dog products on cats for example. Apply the amount indicated only, match the size and treatment amount of the animal being treated. Age restrictions for puppies and kittens on the label are important but can be dealt with if a mistake is made. Monitor side effects or sensitivities after applying the product, especially when applying for first time. Spot-ons are known for making sensitivity problems worse. Don't panic if your pet experiences adverse reactions. The best thing to do at this point is to immediately bathe pet with mild soap and rinsing with generous amounts of water. And always keep package (along with all the tools the fleas and ticks medications, dog flea tick medicine, and other types of dog flea and tick medicine packages came with) and receipt. Cleanliness is your best defense against fleas and almost all pests. Vacuuming daily, this ensures the removal of eggs, larvae and adult fleas; this method is on of the best ways for your initial control of a flea infestation. Vacuum the following areas thoroughly: crevices on floors, cushioned furniture, cracks, carpets, along baseboards and the basement. Steam cleaning carpets may turn out more helpful than you might think, the reason why is, that hot steam and the soap used (a good carpet cleaner will exactly what to use) can kill fleas in all stages of the life cycle (i.e., eggs, larvae, and young and adult fleas). Don't forget the areas where pets sleep. Here's a great carpet cleaner who can help you out. Rick, the owner, always answers. Wash all family and pet bedding hot, soapy water every two to three weeks. In cases of severe infestations, discard pet bedding, replacing it with fresh and clean material. Flea combs are another effective tool to use for young and adult fleas. These work exceptionally well in removing fleas as well as flea feces and dried blood. 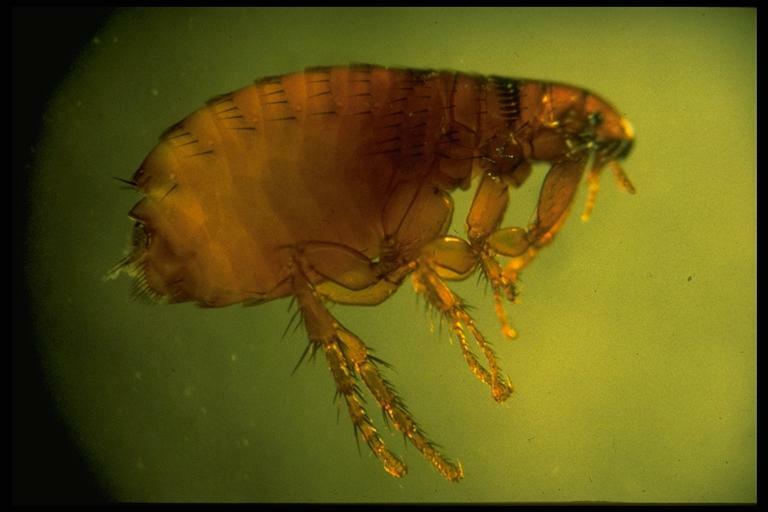 Focus combing parts of the pet where fleas congregate the most which are usually the neck or tail area. Deposit fleas in hot soapy water which kills them. At this point you should consider keeping pets indoors to get the most out of a flea and tick treatment. 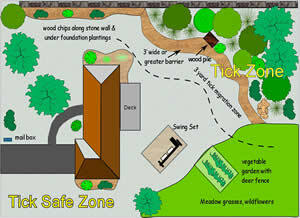 Modify your landscape to create Tick Safe Zones. To do this, keep play areas and playground equipment away from shrubs, bushes, and other vegetation. Also, regularly remove leaf litter and clear tall grasses and brush around homes, and place wood chips or gravel between lawns and wooded areas to keep ticks away from recreational areas. Provide a vegetation-free play area. Keep play areas and playground equipment away from away from shrubs, bushes, and other vegetation. Use a chemical control agent. Effective tick control chemicals are available for use by the homeowner, or they can be applied by a professional pest control expert, and even limited applications can greatly reduce the number of ticks. A single springtime application of acaricide can reduce the population of ticks that cause Lyme disease by 68-100%. Discourage deer. Removing plants that attract deer and constructing physical barriers may help discourage deer from entering your yard and bringing ticks with them. Great deer tick control tip!